Google Analytics – We use Google Analytics on our website and follow Google guidelines to implement anonymous reporting of site usage. Our current data retention setting is 26 months. Read a technical explanation of how Analytics anonymizes IP addresses here. If you would like to opt-out of Google Analytics monitoring your behavior on my website please use Google Analytics Opt-out. 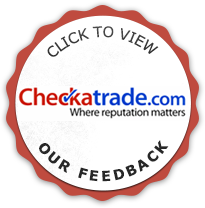 Checkatrade – We use the trade directory and feedback services of Checkatrade. You can see their Privacy Notice here: Checkatrade Privacy Notice.